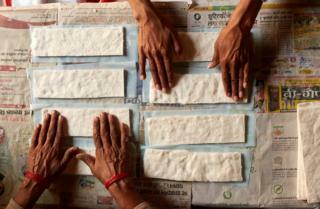 A film based on young women in an Indian village who make sanitary pads has won an Oscar for best documentary short. 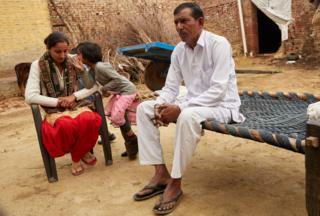 The BBC's Geeta Pandey met the women in their village before the ceremony. Sneh was 15 when she started menstruating. The first time she bled, she had no idea what was happening to her. "I was very scared. I thought I was sick with something very serious and began crying," she told me when I visited her home in Kathikhera village not far from Delhi earlier this week. "I didn't have the courage to tell my mother so I confided in my aunt. She said: 'You're a grown woman now, don't cry, it's normal.' It was her who told my mother." Sneh, now 22, has travelled a long way from that point. 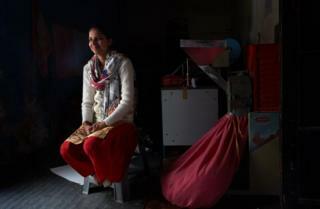 She works in a small factory in her village that makes sanitary pads and is the protagonist of Period. End of Sentence., a documentary that has been nominated for an Oscar. She will be attending Sunday's ceremony in Los Angeles. The film came about after a student group in North Hollywood used crowdfunding to send a pad-making machine - and Iranian-American filmmaker Rayka Zehtabchi - to Sneh's village. Just 115km (71 miles) from Delhi, Kathikhera village in Hapur district is a world far removed from the glitzy malls and high-rises of the Indian capital. Normally, it's a two-and-a-half-hour drive from Delhi, but construction work on the highway slows it down to four hours for us. And the final 7.5km drive to the village from Hapur town is a crawl, on narrow winding roads lined with open drains on both sides. The documentary is filmed in the farms and fields - and classrooms - of Kathikhera. Like in the rest of India, periods are a taboo topic; menstruating women are considered impure and barred from entering religious places and often excluded from social events too. With so much stigma surrounding the issue, it's no surprise that Sneh had never heard of periods before she started getting them herself. "It was not a topic that was discussed - even among girls," she says. Why are Indian women 'Happy to Bleed'? 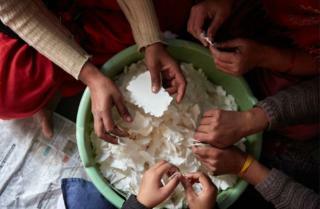 But things began to change when Action India, a charity that works on reproductive health issues, set up a sanitary napkin manufacturing unit in Kathikhera. In January 2017, Sneh was asked by Suman, a neighbour who works with Action India, if she wanted to work in the factory. A college graduate who dreams of working for the Delhi police one day, Sneh says she was excited. After all, there were "no other job opportunities" in the village. "When I sought my mum's permission, she said, 'ask your father'. In our families, all important decisions are taken by men." She was too embarrassed to tell her father that she was going to be making pads so she told him that she would be making children's diapers. "It was two months into the job that mum told him that I was making pads," she laughs. Much to her relief, he said, "That's alright, work is work." Today, the unit employs seven women, between 18 and 31 years of age. They work from 9-5, six days a week and are paid a monthly salary of 2,500 rupees ($35; £27). 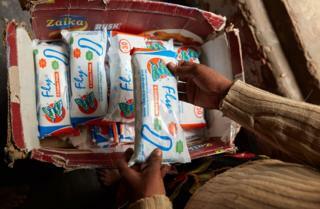 The centre produces 600 pads a day and they are sold under the brand name Fly. "The biggest problem we face is power cuts. Sometimes we have to come back at night to work when the power is back to meet the targets," Sneh says. 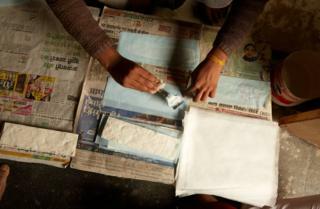 This little business, run from two rooms in a village home, has helped improve feminine hygiene. Until it was set up most women in the village were using pieces of cloth cut out from old saris or bedsheets when they had their period, now 70% use pads. It's also de-stigmatised menstruation and changed attitudes in a conservative society in ways that were unimaginable just a couple of years ago. Sneh says menstruation is now discussed openly among women. But, she says, it's not been an easy ride. "It was difficult at the start. I had to help my mother with housework, I had to study and do this job. Sometimes during my exams, when the pressure became too much, my mother went to work instead of me," she says. Her father, Rajendra Singh Tanwar, says he is "very proud" of his daughter. "If her work benefits the society, especially women, then I feel happy about it." 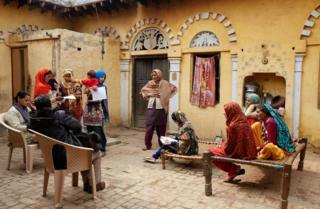 Initially, the women faced objections from some villagers who were suspicious about what was happening at the factory. And once the film crew arrived, there were questions about what they were doing. And some, like 31-year-old Sushma Devi, still have to fight daily battles at home. The mother-of-two says her husband agreed to let her work only after Sneh's mother spoke to him. He also insisted that she finish all the housework before going to the factory. "So I wake up at 05:00, clean the house, do the laundry, feed the buffaloes, make dung cakes which we use as cooking fuel, bathe, and make breakfast and lunch before I step out. In the evening, I cook dinner once I get back." But her husband is still unhappy with the arrangement. "He often gets angry with me. He says there's enough work at home, why do you have to go out to work? My neighbours too say it's not a good job, they also say the salary is low." Two of Sushma's neighbours had worked at the factory too, but left after a few months. Sushma has no intention of doing the same: "Even if my husband beats me up, I will not give up my job. I enjoy working here." In the documentary, Sushma is heard saying she'd spent some of her earnings to buy clothes for her younger brother. "If I'd known this was going to go to Oscars, I would have said something more intelligent," she says, laughing. For Sushma, Sneh and their fellow workers, the Oscar nomination has come as a big boost. The film, which is available on Netflix, is nominated in the Best Short Documentary category. As Sneh prepares to leave for Los Angeles, her neighbours are appreciative of the "prestige and fame" she has brought the village. "No-one from Kathikhera has ever travelled abroad so I'll be the first one to do so," she says. "I'm now recognised and respected in the village, people say they are proud of me." Sneh says she had heard of Oscars and knew they were the biggest cinema awards in the world. But she had never watched a ceremony, and certainly didn't think that one day she would be on the red carpet. "I never thought I would go to America. Even now I can't fully process what's happening. For me, the nomination itself is an award. It's a dream that I'm dreaming with my eyes open."